So - as you may have gathered by now I ordered just a few cook books during the boxing week sale from Indigo/Chapters (I have a small bookshelf of cooks books already but I couldn't resist). This cookbook by Gordon Ramsay I found by searching the deals on the Indigo website. As soon as I saw the title and read a little bit about the book I knew that I really wanted the book. I have always admired Gordon Ramsay as a chef - not because of his TV personality for yelling at people but for what I see as his desire to inspire, teach and help people cooking. If you have only seen Hells Kitchen I can imagine what you think of that statement; however, his appearances on MasterChef and the F-word show a different side to him - strict and stern for sure but also full of encouragement. This cookbook is based on his TV show "Gordon Ramsay's Ultimate Home Cooking" which I was only able to see one or two episodes of but it was enough to inspire me right away to try I think four different things that I saw in one show. I'll be reviewing a few more of the cook books that I have had hanging around in my house - and that I just got over the next year but I really felt the need to start with this book. (Note: I think you can watch the show online through Food Network Here). I will start by saying this - I am a home cook who still has a LOT to learn but I am also very talented and skilled at cooking (I don't do well with being positive about myself). The book is a very nice mix between instructions and recipes. 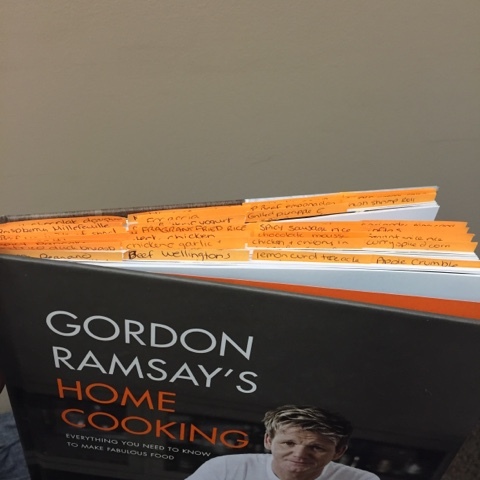 The funny thing is I can hear Ramsay's voice in my head when I am reading portions of the cook book. The book is divided into sections not based on courses but more thoughts or techniques or goals - such as preparing a head, quick meals etc. Between each section there is a ton of information - like how to de-bone a chicken, the different types of fish, how to break down a fish, different cuts and types of meat - like I said a lot of information in a very practical and useful form that is not specifically tied to a recipe but is used in following recipes. The information would be very useful to those just starting out in the kitchen and definitely still very useful for those that have more experience in the kitchen and want to learn more. All the things to try! So on the useful information - not just a cookbook - I cannot rave enough about the book. But then we come down to recipes. Given the challenge (and even my love for cooking) when I get a cookbook I tend to sit down and read through it checking out what inspires me or what I might like to try. The problem I have found is then being able to remember what's in each book that I want to try and then forgetting about potentially really good ideas or recipes. I found a simple and novel salutation to this problem! I have taken to flagging recipes with post it notes along the top of the book. I also would like to point out that I am not scared of writing in my cookbook - go ahead give it a try I highly encourage it - write your thoughts, modifications or ideas for next time treat your cookbook like a note book not something to be preserved (protected from food definitely but not preserved). I think my copy of this cookbook is now more post-it than books I have so much love for it. I made a plan for this week of the things I wanted to try and I can say that almost ALL of the recipes came from this book. So with that being said I give the cookbook 5 out of 5 stars!